They say to never name an animal you intend to eat. I've never subscribed to this theory, noting that this only serves to further disconnect myself and others from what's really going on. I raise animals for food. I'd like you to meet Kevin...Kevin Bacon to be exact. I know what you're thinking here and yes, I really am going there with this post. So I was at my local grocery store the other day and ventured into sections of the store I rarely go into anymore; meat, dairy, and eggs. So many buzz words ~ so little meaning behind any of them. 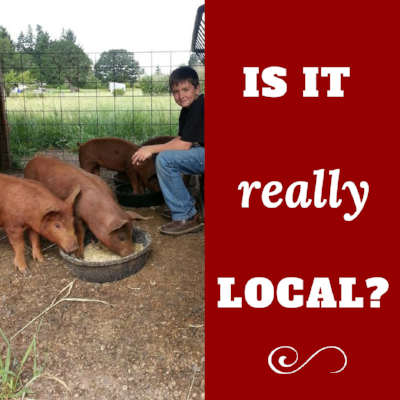 Local, natural, pasture-raised, humanely-raised, etc... These words USED to mean something I think, but along the way, and without much regulation, they just don't anymore. "If I had a question about this food item, who would I ask?" I envisioned myself calling XYZ Food Corp with their sunny, pastoral scened packaging of happy cows and hens. There's not a phone number on the packaging but, if I could find one, I'd likely end up in their never-ending phone system of..."Press 1 for the Warehouse, Press 2 for Human Resources, Press 3 for Consumer Relations..."
Okay so back to Kevin. Let's trace our way back. 6. Have questions about how the meat is cut, wrapped, smoked, cured or anything else about the process? Talk to Casey and his crew at The Meating Place. 5. Curious about what it means to slaughter an animal as humanely as possible? Talk to Andy at Turner Custom Harvest who drives to farms every day and with great precision and care, dispatches the animal so they don't have to endure a stressful trailer ride or a slaughterhouse holding pen. 4. Want to know how he was fed, housed, allowed to root and graze fresh pasture, and bask in the sun? Talk to me. I can tell you everything, up to and including, his personality. Yes, farms animals really do have their own unique personalities. 3. Have detailed questions about the food Kevin ate throughout his lifetime, ask Connie at Union Mills Feed, a family owned and operated feed mill based in Mulino, OR, where his food was made. 2. Want to know how Kevin was farrowed (born) or how his mother is kept? Ask Cara, the breeder who humanely farrows hogs on her family's farm here in Oregon. 1. Kevin. We've made it all the way back to Kevin. How many actual people in your community can you name at the various touchpoints? Simply put, the more - the better. Local is about Community. Transparency. Communication. Accountability and personally vetting along the way. I get that it's nearly impossible to shop local for everything. Bananas, for example. While I'm sure there's a greenhouse grower somewhere in Oregon with a few banana trees, I've never seen a banana farm in Oregon. I can only improve my local buying power by purchasing them from John at my local fruit and veggie stand, Milk Creek Produce. This is about as close as I'm ever going to get to the 6 six degrees of bananas. I think where we went wrong in our food system has a lot to do with losing connection with all those names and faces along the path to your plate. Running my farm with purpose, intention and a mindfulness to connect with my local community has been the guiding light in every decision I make. I know that it has been food for my soul and I hope that it shines through in the milk, meat, and eggs we provide to our local community.